CBS Outdoor sent me an email about the success of the first month of Westfield, London's new giant mall. The email gives statistics on Westfield shopper numbers for the first month. Since opening Westfield has seen more than 3 million visitors. On its opening day CBS stated that Westfield had sales revenue of £10million, with Drapers Record noting that this driven by the 160,000 first day visitors. CBS Outdoor also claim the new format 57" HD digital pods inside Westfield have also been successful, with Warner Music driving a 75% sales uplift in Westfield stores compared to sales in other non-promoted outlets. However, whilst Westfield has pulled in the crowds, online retailing has also been booming in the UK. According to Hitwise 'Mega Monday' (the UK equivalent of 'Cyber Monday') saw a year on year sales increase of 18%, but as with 2007 the pre-Christmas peak seems to have been at the end of November. 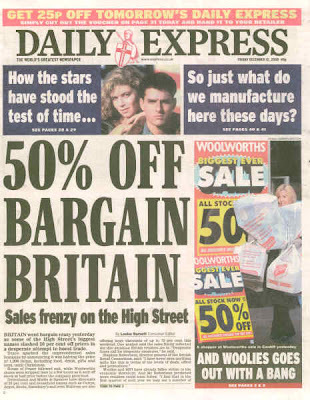 Traditionally the after-Christmas sales create the highest online retail traffic / sales volume, but will 'Bargain Britain's' pre-Christmas discount frenzy dent post-Christmas demand?